Today’s Nice Price or Crack Pipe Corvette proves that silver was once an interior color option. Let’s see if this unique drop top is priced to take the gold. I’m sorry that I wasn’t able to initially present yesterday’s 1988 BMW 635CSi bathed in the aura of an angelic halo as it deserved. Budget constraints and all that. Yes, E24 Bimmers are treated reverently around here and the price of that one proved it to be no different, coming in at a sizable 67% Nice Price win. If those big BMW coupes represent some of the most venerated offerings of a storied marque, what might just be the opposite: a less than loved member of a famous line? Yes, you in the back, did you say mid-‘70s Corvettes? You are right! 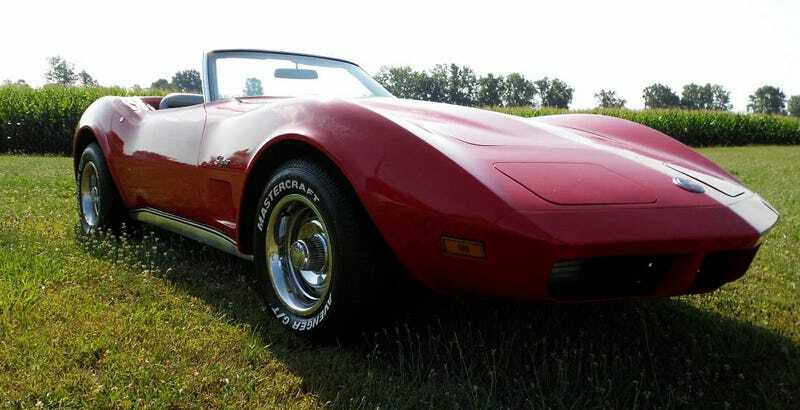 This 1974 Corvette convertible may just change your mind, however. As we all know, when it comes to C3 ‘Vettes it’s chrome bumpers or GTFO. That being said, those earlier cars are now pretty crazy expensive. The ’73 was a weird transition car with a chromed split-blade bumper in back but a urethane cap in front. I don’t know about you but I prefer when the cuffs match the collar. That was once again the case in ’74 when they went plastic on both ends and the car looked a hell of a lot more cohesive for it. You might note that Chevy couldn’t do the rear bumper in a single piece yet so this year has a vertical seam in the cap, right between the V and the E.
New paint, tires, brakes, convertible top, and interior round out the major plusses on this car making it look like it’s ready to hit Cruise Night just as it sits. Let’s talk a little bit more about that interior if you don’t mind. The interior is silver. Like, Mercury astronaut spacesuit silver. This was an option on this era of ‘Vette (Vinyl RPO 406 or Leather RPO 407) but who knew anyone ever really checked either of those boxes? It looks, how shall I say this… amazing. I mean, it’s like something described in a David Bowie song. The silver brightens the interior space significantly, even over beige, and isn’t as tacky as white. Perhaps the most amazing aspect of the interior as presented by the seller is the fact that someone was able to procure a sufficiently similarly hued steering wheel wrap for the car. Okay, are you changing your mind on the later C3 Corvettes yet? Maybe the price tag—which is $13,000, or about the price of a Kia Soul—might further sway you. What do you think about that $13,000 for this amazing silver interior-having ’74 Corvette, does that seem like a deal? Or, despite all the silver, does that price make you not want to give up your gold? Columbus OH Craigslist, or go here if the ad disappears. For $7,500, Does This 1988 BMW 635CSi Jump The Shark?